Bruxism is the habit of clenching or grinding your teeth involuntarily. It usually happens during sleep, due to an increased activity of the elevating muscles of the jaw. 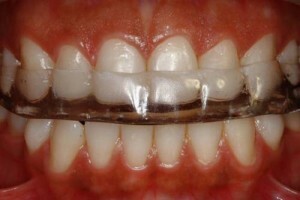 This generates wear of the teeth and it can cause facial muscular pain. The main trigger tends to be psychological, stress being one of the most important factors. The cause of bruxism is subconscious, acting indirectly on some people and therefore causing this disorder. As opposed to other pathologies, like cavities or gum disease where prevention is key, bruxism is an involuntary habit and most patients do not even know they have it until they feel muscle pain or the teeth wear becomes evident. Therefore, it is important that the dentist identifies this condition at its early stages. They will explain the need for a relaxing mouth guard or night guard that will stabilise the stomatognathic system and prevent further complications: if the teeth grinding becomes pathological, it may even compromise the temporomandibular joint (TMJ). What is a relaxing dental guard? 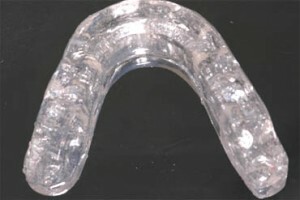 This is a splint made from hard resin. It is U shaped and adapted to the patient’s teeth. They are custom made and fitted to each patient following specific clinical criteria. In making it, the use of a semi adjustable articulator is key, and contacts have to be bilateral and pointy, so that perfect neuromuscular relaxation and pacification can be achieved. All this translates in comfort when being used by the patient. This relaxing dental guard can be made for the superior or inferior jaw, depending on each case and patient. Common symptoms Pain is the symptom that usually moves people to visit de dentist. Pain can be muscular, or it can be dental, and cause generalised tenderness.It can also be acute, sometimes affecting the TMJ and even moving on to affect the neck and face. Teeth grinding also leads to wearing of the teeth surfaces and in extreme cases even to tooth fracturing. Some symptoms are key to identifying if we have bruxism. How to Treat it With timely detection, the patient may be treated with a relaxing dental guard, that should be used during night-time and, if necessary, also during the day. If the patient suffers persistent and strong pain, muscle relaxants may be indicated, and even stress and anxiety medication, as well as physiotherapy.Bruxism is an involuntary behaviour and therefore we cannot talk about prevention but we can aim for an early treatment.